Despite the best efforts of freezing winds and the utter incompetence of Southern Rail, around 100 hardy souls managed to make it to Eastbourne for the winter leg of London on Board’s bi-annual board game extravaganza. Returning to The Cumberland was like warmly hugging an old friend, despite it only being our second time here. It has that creaky, tired charm you tend to find in English seaside resort hotels – all creaking floorboards and wobbly staircases. But it’s friendly and we have the place to ourselves for four solid days of drinking gaming. I’ve been having a crappy time of late, so it as nice to get away from reality for an extended weekend. But geography can only take you head so far and I found myself playing a lot fewer games than usual, preferring to spend quite a bit of time just relaxing and emptying my mind. 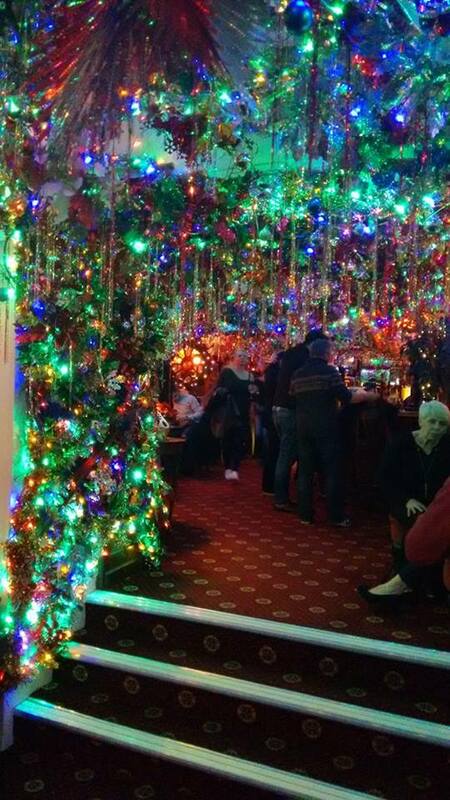 The Marine’s Christmas grotto (pictured) certainly helped for an evening out and about, while the nearby Victoria was also lovely. Even the dodgy looking American diner in town served up some pretty great food. I love our Eastbourne trips the way they are – a big room of gamers playing, drinking and trash talking. So the addition of a bring-and-buy, secret santa and probably some other newfangled ideas for the kids totally passed me by (but were apparently enjoyed by those who got involved). And I’m glad I didn’t get involved, as I was probably hiding away in my room while they were going on anyway. I did manage to play 17 games (13 different ones) over the four days, including quite a few gems I’d missed from Essen 2016. But as always it was more about the people – catching up with old friends and making new ones. To everyone I gamed with, and/or had a beer/meal with, thank you – and see you next time. Terraforming Mars: This was comfortably the game I most regretted not bringing home from Essen – and it turned out to be everything I’d hoped it would be. It has the tough decisions and massive card stack of Race for the Galaxy, but without the confusing iconography. It also adds a board, a mild ‘take that’ element that works and about two hours more playtime per game – but it genuinely flew by. This is definitely a game I will be getting my hands on as soon as they manage to get it back in print. Lorenzo il Magnifico: Another I’d had my eye on at Essen, I’d cooled on it after being pretty bored by the design team’s previous release, Grand Austria Hotel. This is also a dice-based action selection euro game, but a great improvement on its predecessor – it halves the game time by largely eliminating the AP downtime. It does this by reducing the game space considerably – there are fewer wordy options, but the decisions are much more meaningful and it still feels as if you’re all traversing different paths. I have some doubts about its longevity, but if I get 5-10 plays out of it that are this much fun it’ll worth the entrance fee. Fabled Fruit: The latest idea from the unique mind of Friedemann Friese, I’d decided against pursuing this at Essen because you can never be sure if his games are more about a concept than actually having any fun. But post-Essen reports had been positive, so I made sure to get a few games in. It proved to be a great little simple card game, where you stayed engaged because the mix of available actions changes a little every few turns. It’s not a crazy change, as in Fluxx, but much more subtle – it keeps you on your toes, but never feels complicated. I won’t be seeking a copy out, as I don’t think my regular groups will car enough, but I look forward to exploring it more when I get the opportunity. Manhattan Project – Energy Empire: The spiritual successor to Manhattan Project polishes the kinks out of the original design, making it a much smoother ride. But in doing so it takes out all the take-that and the end game tension, making it a rather solitary engine building affair with a set number of rounds. I really enjoyed my play and would play again, but was left feeling the perfect version of this game is somewhere between the two – and hopefully still in the making. Oh My Goods – Longsdale in Turmoil: I’ve enjoyed my plays of Oh My Goods and was keen to try the expansion. You can absolutely see what he was trying to do here – but unfortunately it seems he wrote the ideas on the back of a fag packet and they published them by mistake. Much as with Manhattan Project above, a reprint of the original with a lot of this included (after some serious work on it) could be awesome – but this feels wholly unfinished. Each player could’ve won, depending on which interpretation of the rules you decided to throw up in the air. Dale of Merchants: Sometimes you start playing a game and just think, Kickstarter. This is one of those games. There’s nothing wrong with it – there’s just no point in it existing. From the mediocre mechanisms, terrible title and clichéd fantasy animal setting to the mass of options that will never make the game different enough each time to care about, it’s just an over-complicated exercise in draw one, play one with way too much AP-inducing card text. Really, really average – never again. The Dwarves: Once again Sean and Natalie joined our latest attempt to save the world from trolls, orcs and dark elves – this time joined by Hella and John Mitchell. We played the ‘Book 5: Triumph of the Dwarves’ mini expansion on ‘difficult’ and, after a relatively simple start to the game, I decided to spruce things up with some epicly bad Sean-esque dice rolling. Luckily I redeemed myself (a bit) in the final battle to secure a very narrow win with just a couple of turns to spare. Love it. Armageddon: I explained the rules (poorly) to Hella, Sherine and Teri – and then Teri showed us how to play the game. I was lucky to end up joint third, but more disappointed to find a couple of the end game tiles are problematic balance-wise. Don’t look at me! Also gave everyone a chance to mock me as they wandered past – which was much like I imagine it feels like being in the stocks! Hats off especially to Jacob who mocked me, came back and told me how much he actually enjoyed his one play of it, before walking away – and then thinking better of it, doubling back, and mocking me again. Planet Defenders: I’m still reserving judgement on this one, because it has garnered such mixed reactions – weird for such an innocuous game. It’s a cleverly designed puzzle game where you’re essentially trying to fulfil cube combos to capture robots. But the art is cute, it plays fast and there are some nice little tech cards to differentiate the players. It may be a layer short of holding the imagination of more experienced gamers, but I don’t think that makes it a bad game – more a family or gateway game that doesn’t overstay its welcome. More on it soon. Navegador: In a year dominated by review plays, my three plays of Navegador make it stand out as one of the most popular of my oldies – and this was another fantastic play through. The builders (Karl and me) got going faster than the explorers (Anne and Adam) and we were about 10 points ahead of them by the end – with Karl pipping me by three for the win. Acquire: Another old favourite, this turned out to be my 10th play of the 60s classic – but I didn’t have it my way. A great start was scuppered mid game as my stock of hotel making pairs dried up – leaving me holding a lot of stock in a dead chain and my influence dwindling. But it was great fun, as always. This is a game I very rarely reach for on my own shelves, but am always happy when someone else suggests it – so thanks for doing so Simon! 6 Nimmt! : I entered a LoBsterCon tournament for the first time – and ended up coming third. I really don’t like tournaments, they can really drag, so I’ll probably end up going out on a high. Three went through to the final table from the two starting tables, from which I progressed in second place. Two players fell early in the final and I was in a strong position, until one bad hand left me adrift of the top two. The final hand saw one card I played (I couldn’t have seen it coming) really stitch up Rocky (which is always fun) and ultimately it handed Marcus the trophy. But despite it going very long for what should be a short, fun party game I did really enjoy it. Race for the Galaxy: Can this really only be my sixth play of the year of my favourite game…? Shocker – and it shows what a strange year it has been for me. It was an enjoyable five-player game, despite a couple of newbies struggling their way through making it very slow (never something I really care about). I used the contact specialist to spam out a bunch of military windfall worlds, guaranteeing myself a regular stream of cards to choose from and a steady flow of points. Laying the nine-point grey rebel world sealed a narrow win in the final turn. And what better note to end a con report on, than with a scrappy victory? This entry was posted in Board games, Essen, Games, Travel by Chris Marling. Bookmark the permalink. In other news, I’ve let the good people at The Grauniad know that their Top 10 list of festive pubs in the Uk for Chrimbo drinks is lacking.